Sundays were always a special day when I was growing up– it was a time for our family to get together and spend time enjoying each others company. Of course, that always meant a large meal, usually where tomato sauce was involved and a several course meal. 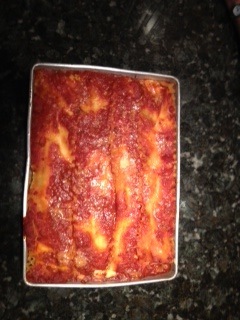 Perhaps no other dish screams Sunday afternoon or special occasion such as lasagna. In episode 20, we share one of my most beloved recipes, hand delivered to you from how I remember it from my mother and the stories from the old country in Italy. 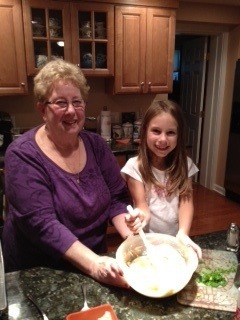 My granddaughter, Maléna, joins me in cooking up this lasagna– her special touch adds a lot! My lasagna takes about 1 hour to prepare. The recipe I share is for a large lasagna pan, approximately 22 inches long, 10 inches wide and 3-4 inches deep. You can make the lasagna any size you’d like– simply modify the amount of the ingredients. I like to have left over lasagna since it stays well and makes for a great meal anytime. Put the ricotta cheese in a large bowl. Mix in the eggs, chopped parsley, a couple tablespoons of romano cheese and salt and pepper. Mix together thoroughly, then set aside. Cover the bottom of the pan with tomato sauce. Layer the cooked lasagna pasta length-wise, covering the bottom of the pan. Using a large spoon, place spoonfuls of the ricotta cheese on top of the lasagna pasta. You want enough so that you can spread it out with a spoon, covering all of the pasta. Add 1-2 ladels of tomato sauce on top of the ricotta. Using a fork, mix the ricotta and sauce, spreading it out evenly on top of the pasta. Next, break up 2 meatballs with a fork into large chunks. Spread the meatballs in with the ricotta and sauce mix on top of the pasta. When completed, place another layer of pasta on top, completing covering the ricotta, sauce and meatball mix. Repeat the same process with the ricotta, sauce and meatballs until you have enough layers to reach the top of the pan. At the end of the final layer, spread the shredded mozzarella cheese on top, then place another layer of pasta on top of that. This is your final topping. Spread some tomato sauce over the top, then sprinkle some grated cheese. You are now ready to put it in the oven! Place the finished pan of lasagna into the oven at 350 degrees for about 35 minutes. You’ll know it’s done when the top layer starts to look slightly browned. Take it out of the oven, let it cool off for 10-15 minutes, then serve! I have a number of “staple” recipes in my kitchen, and one of them is my chicken soup. My kids, grandkids and entire family love my chicken soup and I am excited to share the recipe with you. 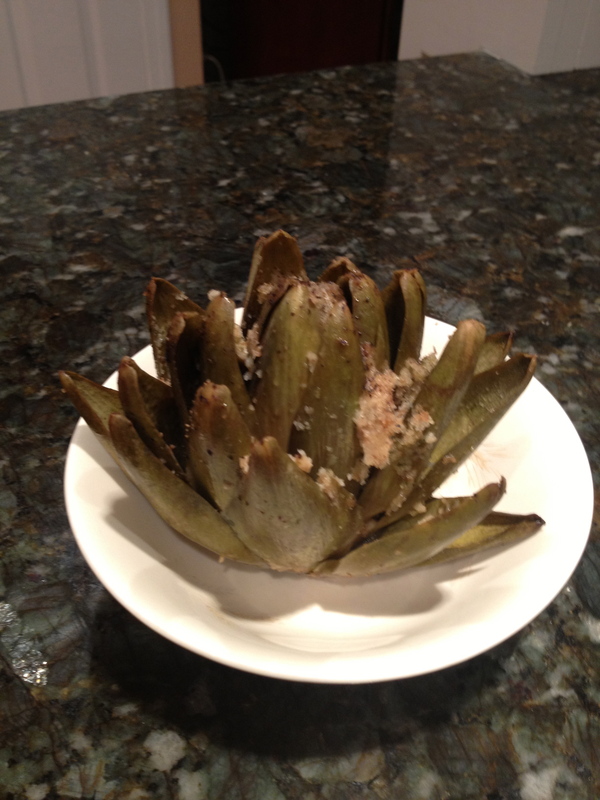 It is great as pre-main meal appetizer or as a meal unto itself. We make it year round– including in the summer! There’s never an end to chicken soup season! 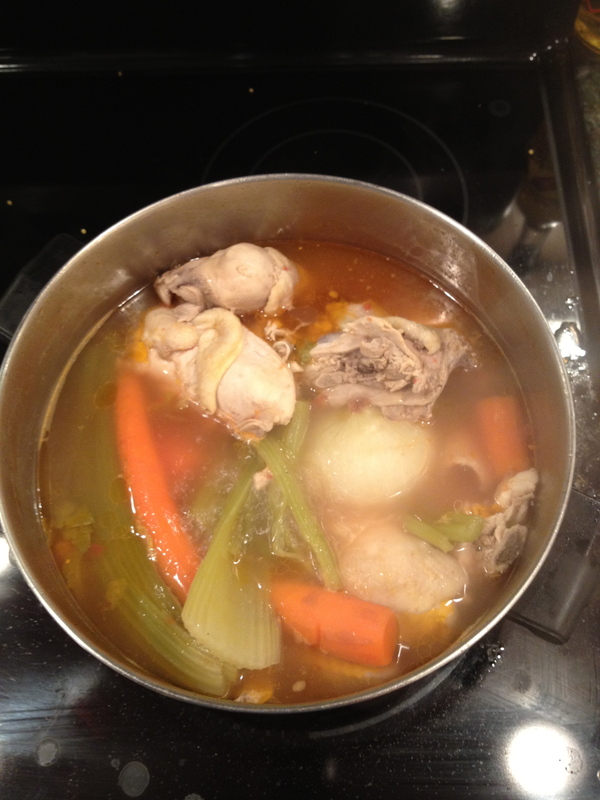 I serve my chicken soup at Thanksgiving time and other holidays as an appetizer. Served hot and prinkled with some fresh parmagiano cheese, there’s nothing better! My recipe is very straightforward. 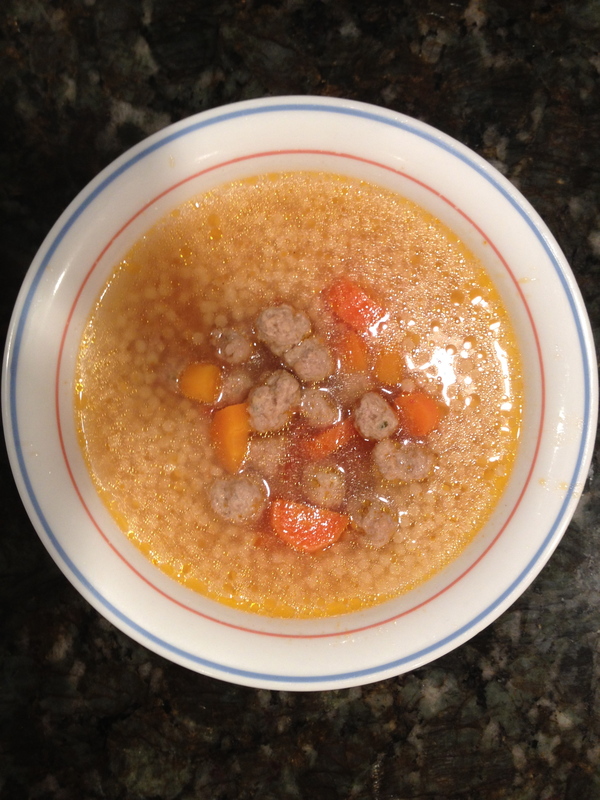 Unlike most other chicken soup recipes, I include mini-meatballs as part of the recipe. I make the base soup, and then mix the broth with the meatballs and pasta. 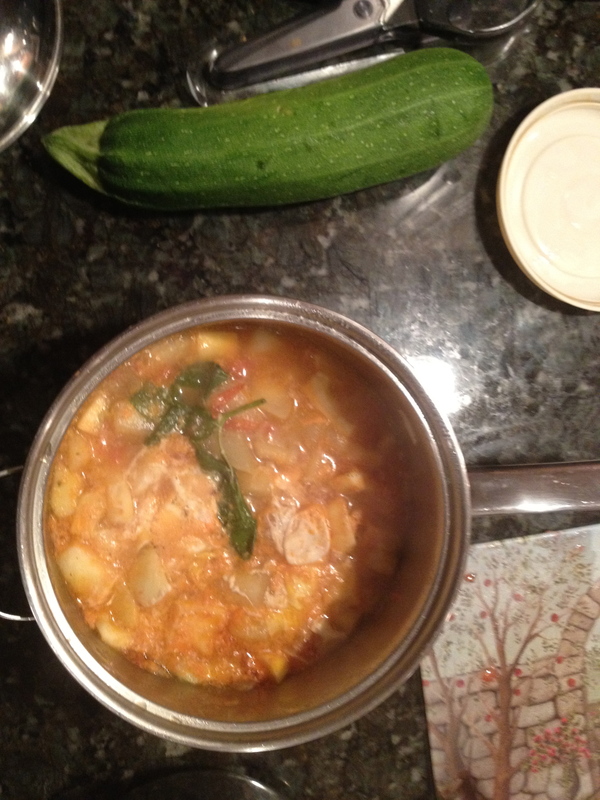 I also serve the chicken and vegetables on the side, which can then be added to the soup mix. First, you will need to clean and butcher the chicken. Place the chicken in a big pan of water. Sprinkle the chicken with some salt and let soak for 10 minutes. Next, you need to cut the chicken up, cutting the wings, legs and back into pieces. Wash the chicken, then add it back to the pan, covering it with water. Put it on the stove and let the water heat until you see all the excess waste material floating at the top. Turn off the heat, and then pour out all the water, straining the chicken. Rinse the chicken and then place back into a large pan and put on the stove. Peel skin off the onion, leaving it whole. Put it aside in a bowl with some water. Next, take the skin off the carrots and cut off the ends. Place aside with the onion. Next, cut the very end of the leaves off the celery. Then cut the celery in half, taking the half with the leaves and placing it in the bowl with the onions and carrots. Place 3 of the cut celery stalks in the bowl as well. Finally, cut 3 of the carrots up with a knife, width-wise. Cut 3 of the carrots in half. Place the carrot halves in the bowl with the onion and celery. Take the carrot “wheels” and place them in a separate bowl (you’ll be cooking these with the meatballs). You can use either ground turkey or beef for the meatballs. Once you’ve prepared the meat for meatballs (see Episode 1 for how to prepare the meatballs), start rolling them with your hands into small meatballs (about the size of a marble). Place them in a dish as you roll them out. Boil some water, and add the meatballs to the water. Also add the carrot wheels. Let the mixture boil for about 10 minutes. Now that you’re done preparing all the ingredients, it’s time to make the soup! Turn the heat on high on the pan with the water and chicken it it (make sure you have enough water that the chicken is covered). Add the whole carrots, onions and celery to the water with the chicken. Add a tablespoon of salt and pepper. Finally, add the tablespoons of tomato sauce. The sauce will give the soup a rich color. Bring the soup to a boil. After 2-3 minutes of boiling, lower it to a simmer. You will need to let the soup simmer for about 60-90 minutes. You’ll know it’s done when the chicken and vegetables are fully cooked. The final step is cooking pasta, which you’ll serve with the soup. I prefer to use small sized pasta, preferably ancini di pepe. Cook the pasta al dente, then strain. When the soup is done, add some soup to meatballs and carrots. Then add soup the pasta. Finally, add meatballs and carrots to the pasta. Serve the chicken and vegetables on the side. Encourage your guests to mix the chicken and vegetables in with the soup! Finally, sprinkle the soup and pasta with some freshly grated parmigiano or pecorino romano cheese. Add pepper if desired. Serve hot and enjoy! The soup is authentic, simple and tasty. It’s great fresh or saved for later. In fact, I often freeze my soupe and pull it out to serve at a later date. 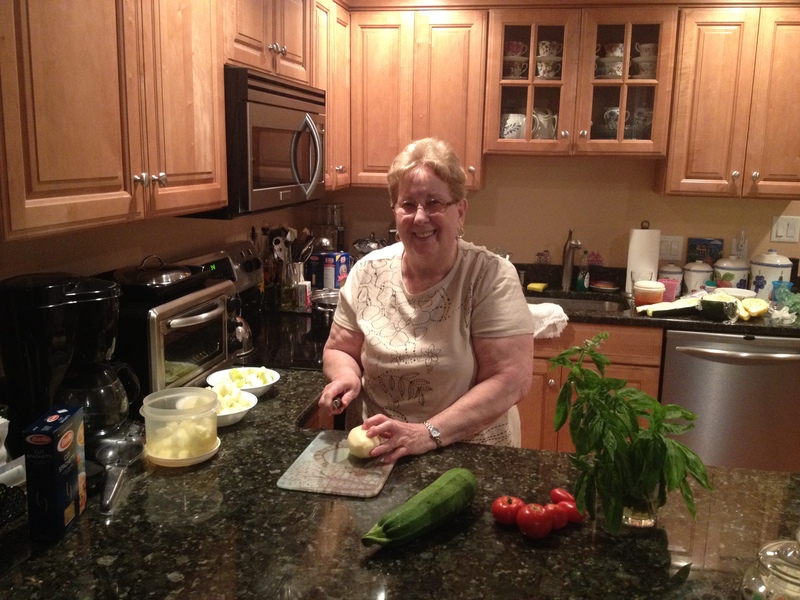 We hope you enjoy Mama Lombardo’s Chicken Soup and will give it a try. Let us know your thoughts! In past times in the “Old Country”, meat was not eaten as regularly as it is today, given scarcity and lack of ability to keep it fresh. When it was served, it was critical to serve it properly, maximizing the flavor and using it creatively. That’s where the recipe we share with you today, braciola, found it’s roots. Braciola means “slices of meat” (with the plural braciole often used as well), and originate in southern Italy, particularly Sicily, which is where my family comes from. 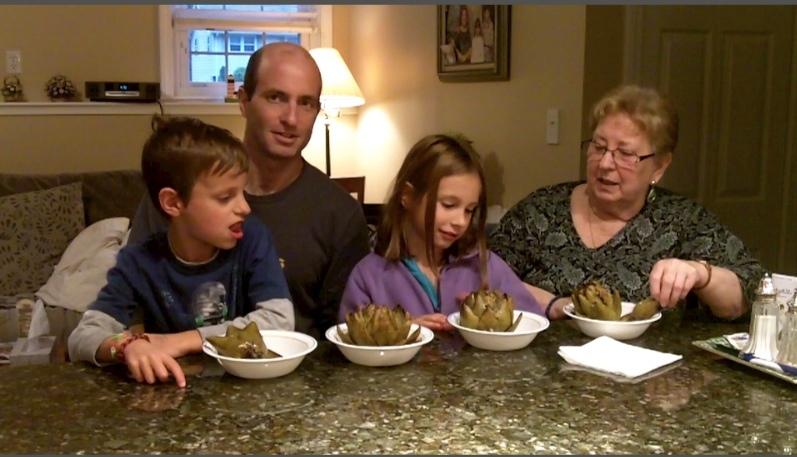 My family brought this recipe over from “the Old Country” when they came to the United States, and it continues to play a central role in the cuisine in my family. Braciola can be cooked with a variety of meats (for example, pork or chicken), but is traditionally cooked with beef, and in tomato sauce. It can be served as a main dish or a side dish. Typically, I cook it with a tomato sauce that I am making, including meatballs, porkchops, sausages and other meats (see Episode 1: Classic Tomato Sauce and Meatballs). I prepare and cook the braciole seperately, and let it cook in the sauce with the other meats for about 2 hours. Once finished, I serve it with pasta and the other meats. Otherwise, braciole makes a great meal into itself. You will need the following ingredients to make enough braciola to serve 3-4 people: 4 cuts of butterflied top round beef, 3 hard boiled eggs, 4-5 inner, tender stalks of celery, 1/2 cup of pine nuts, 3 cloves of diced garlic, 1 small white onion diced up, 1/2 cup of grated percorino romano cheese, 2 tablespoons of salt, and a 1/4 cup of olive oil. You will also need toothpicks and butcher’s string to tie the meat. Finally, you will also need to prepare your tomato sauce (see Episode 1). Once you get the proper cut of meat, you are ready to begin. Braciola is simple to make (as are most of the recipes I share with you), and will take about 15 minutes to prepare. You will need to cook it in your sauce for about 2 hours after the initial preparation. To make 4 braciole, you will need 4 cuts of meat. Take the meat and lay it flat on a dish. Slice up the inner, tender celery stalks and spread them evenly on the meat. Do the same with the hard boiled eggs, spreading them out across the meats. Take the pine nuts and sprinkle them on the meats evenly, along with the diced garlic and onions. Finally, spread the cheese and salt across the meat. Once all the toppings are added, you are ready to roll the meat. Rolling the meat is not difficult, but it will take some practice. Getting the proper roll is critical for braciola since it will help ensure the meat is cooked properly and is served properly when sliced. Start by taking one end of the meat and gently folding it on itself until you reach the other end. You want to make sure none of the fillings inside come out, and remain tucked inside the meat. Once you have it rolled, you are ready to seal it shut so that it can be dropped into the sauce for cooking. Start off sealing the meat with the toothpicks, which will help with the initial seal. Put toothpicks on both ends, as well as the middle of the meat to keep it sealed. Next, get about 2 feet of butcher’s string and begin tying the meat securely. Start on one end, getting a solid tie, and follow that by wrapping the meat all the way up until you reach the other end, where you will seal it shut similar to the other end. Cut any excess string off and dispose. Repeat the same process on the other braciole. Now you are ready to cook the meat. Place the olive oil in a wide, flat frying pan and place on high. Once the oil is heated, place your braciole in the pan, turning the heat down to medium. Once the meat is slightly browned, rotate it. Once it’s slightly browned on that side, rotate again. Keep rotating until the meat is browned on all sides. Once you are finished browning the meat, take it directly from the pan, and place it in the tomato sauce. Let it simmer in the tomato sauce for about 2 hours. This length of time will ensure the meat is cooked to a proper level of tenderness and that the flavor of meat is infused in the sauce. After the meat has simmered for 2 hours, you are ready to remove, slice and serve. Start by taking the meat out of the sauce and putting it in a casserole dish. Remove all the string from the meat, using a clean scissors. Next, take a sharp knife and slice the meat width-wise into nice circular cuts. Spread some tomato sauce on top, and place into the oven at about 350 degrees for 7-8 minutes. Remove, and serve right away. 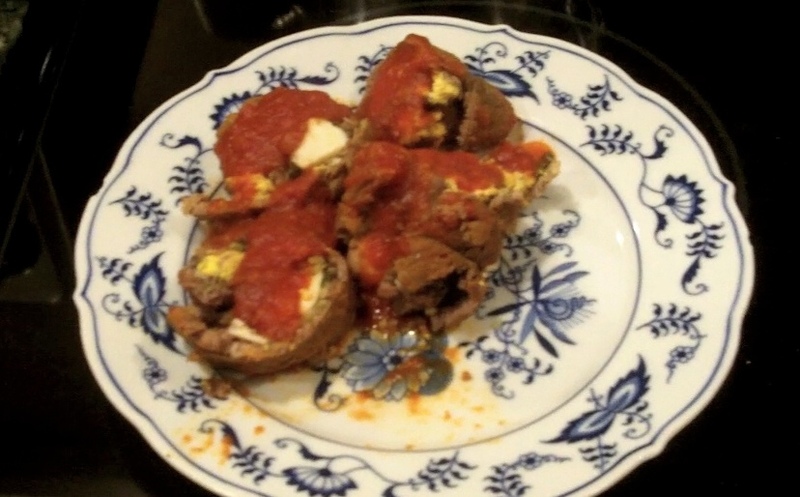 I often will freeze the braciole in a freezer-friendly container, for serving at a future date. It will preserve nicely in the freezer, and serve as an easy way to pull together a quick meal. Hopefully you will give braciola a try, eventually making it part of your regular cooking tradition. Let us know what you think by sharing your comments to this post. Buon appetito! Christmas is a time of year that is full of tradition. In my family growing up, Christmas wasn’t just one day, but an entire season full of spending time with family and eating different foods. The festivities culminated with Christmas Eve and Christmas Day. Fish was (and remains) the food that plays a central role for the Christmas holiday. 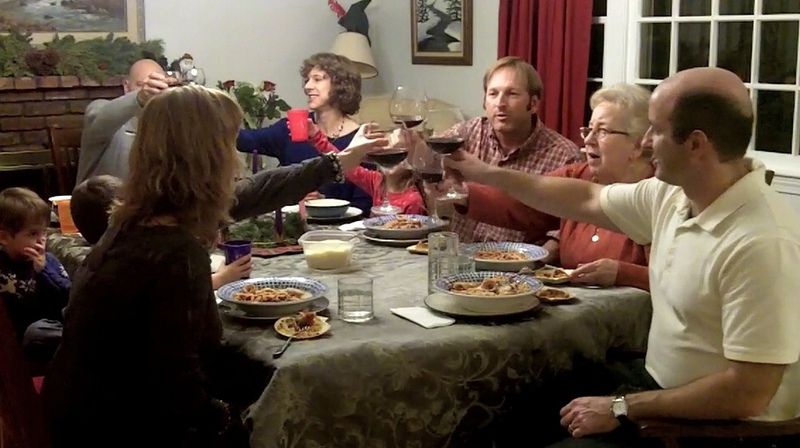 For many Italian families like mine, on Viglia di Natale (Christmas Eve), it’s about La Festa dei Sette Pesci (The Feast of the Seven Fish), where we serve seven types of fish (along with lots of other side dishes), typically served in one at a time in seven different courses. 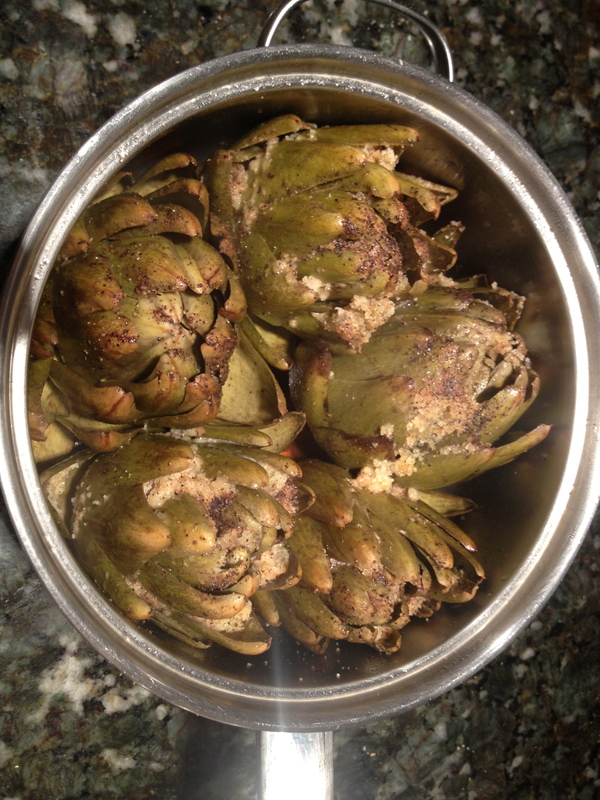 La Festa dei Sette Pesci is common in Italy, particularly in southern Italy where my family came from. The tradition draws its roots from our Christian faith around abstinence, or refraining from eating dairy or meat products on Friday or holidays, including Christmas time. Instead, fish was eaten, typically fried in oil, baked or served with pasta. The reason seven fish are served tie back to Christian tradition as well, specifically to the frequency at which number seven is referred to in the Bible, with seven representing perfect completion. Baby Jesus’ birth on Christmas represents this perfect completion, and seven fish are served for this reason. Seven, however, has evolved to many different numbers– 9, 11, 13, etc., so many families serve more. It makes for a longer meal and more time with family and friends! The fish can be any type of fish, including baccala, scungilli salad, calamari salad, baked cod, stuffed baked lobster, and many other types. In my family, La Festa dei Sette Pesci usually consists of fried smelts, shrimp cooked scampi style with pasta and/or fried shrimp, baked scallops with breadcrumbs, fried grey of sole, haddock prepared pizza aeola style (see Episode 5: Pizza Aeola), and the two recipes we share in this episode: clams casino and calamari ripieni (stuffed calamari) in tomato sauce served with spaghetti. I usually serve clams casino as an appetizer, but it can also be served a main course. It’s an incredibly simple recipe, which only takes about 15 minutes to make. 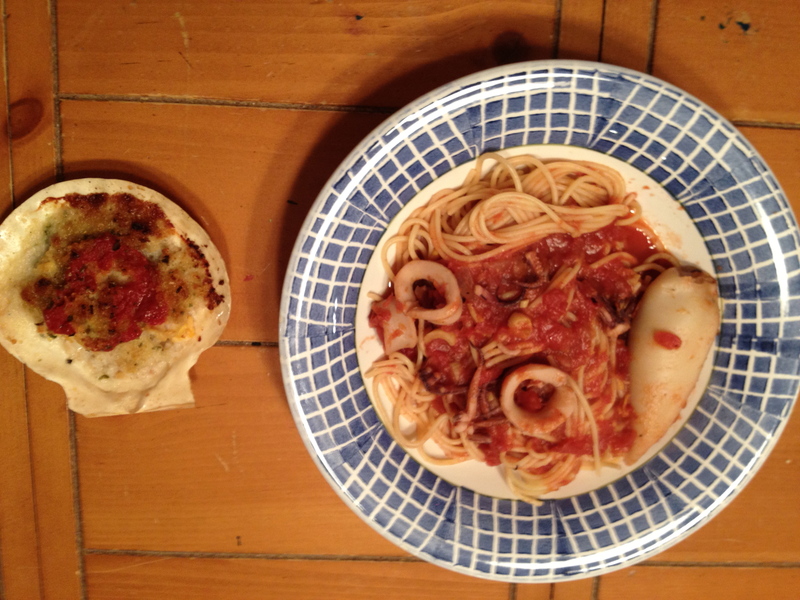 The ingredients you need to make 6-7 clams on a half shell include: 1.5 pounds of fresh minced clams, 1 cup of seasoned breadcrumbs (see Episode 1- Classic Tomato Sauce and Meatballs for how to make the breadcrumbs), 1/4 cup of olive oil, 1/2 cup of tomato sauce, and oregano. 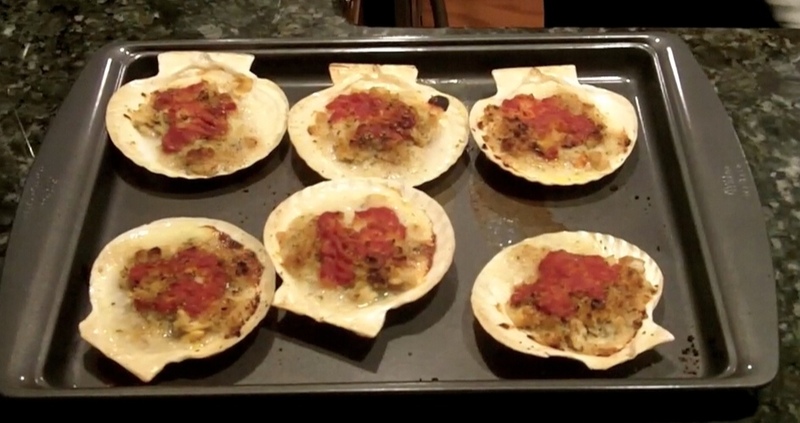 Spread out your half shells on a baking sheet. Evenly distribute the 1.5 pounds of minced clams across the shells, including some of the clam “juice” in the shell. Add the olive oil to the breadcrumbs and mix thoroughly. Once mixed, spread breadcrumbs on top of the clams, covering the entire surface of clams. Next, spoon some tomato sauce on top of the breadcrumbs, then spread it out with a fork evenly over the surface. Sprinkle oregano on each and then place in the oven on a broil at 375 for about 10 minutes. Once golden brown on top, you’re done! Serve hot. Calamari (or squid) is a common type of seafood used in Italian cuisine, particularly in Sicily where the culture and cuisine is so tied to the Mediterranean Sea. There are many different ways to prepare it: fried, marinated in a salad, al forno, among others. My favorite is in tomato sauce and served with pasta. The calamari provide a rich, unique flavor to the sauce. I also stuff some of the calamari, bake it in the oven (al forno) and then add it to the sauce as well. You can serve it al forno style without adding it to the sauce, which is the way I typically make it, but my family likes it in the sauce as well, which is what I’m going to show you today. The ingredients you will need for calamari ripieni in the tomato sauce are: 1 pound of fresh calamari (the whole calamari), 1/4 cup of olive oil, 1 cup of seasoned breadcrumbs, 28 ounce can of tomato sauce, 1 clove of garlic, a 1/4 of a white onion, 1 celery stalk (the inside, tender stalks in the celery bunch), salt and pepper. Start off by cleaning your calamari thoroughly. Most fish markets sell the calamari already cleaned, but you want to make sure you check it over, washing it and removing any additional parts that may have been missed. Once cleaned, get the long, tubular bodies of the squid and cut with a scissors into about 1/2 inch sections. Cut up the tentacles as well. Place these sections aside for now. You will be adding these sections to the tomato sauce. Use about 4-5 (or more if you prefer) of the tubular body sections to stuff. Mix the olive oil with the breadcrumbs and mix thoroughly. Stuff the breadcrumbs into the calamari, making sure you get it well-packed. You need to seal the top of the calamari so the stuffing doesn’t fall out, so pin it shut using a toothpick. 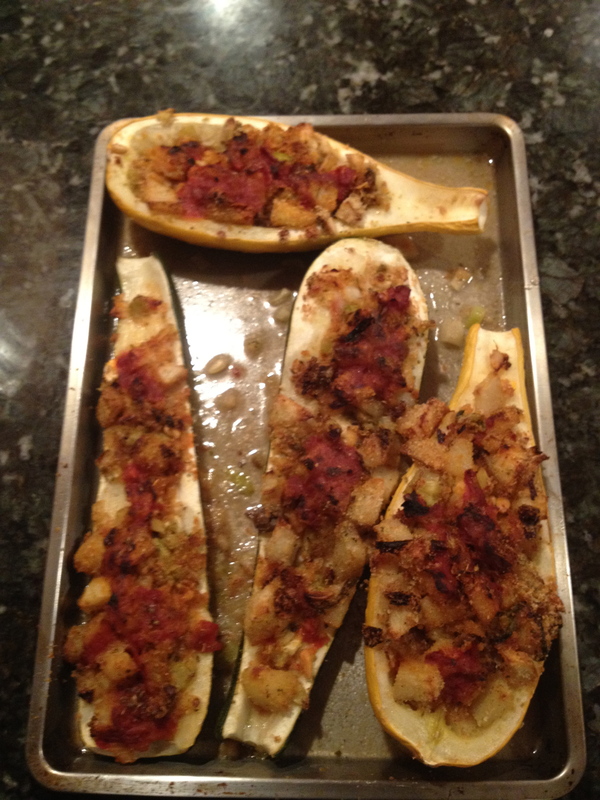 Place the stuffed calamari into a casserole dish, and set aside. Prepare the tomato sauce by heating a sauce pan on medium heat with some olive oil covering the bottom of the pan. Once heated, add the clove of garlic (whole is fine, but you can also mince it), along with the white onion diced up. Saute the onions until translucent. Once done, add in the tomato sauce, a bit of water, and sprinkle in salt and pepper. Let the sauce simmer for about 10 minutes. Next, add the sliced up calamari rings and tentacles to the tomato sauce. Slice up the tender celery stalk into small, diced pieces and add to the tomato sauce as well. The calamari needs only 3-5 minutes to cook, and you don’t want to overcook it since it can become rubbery. So watch it carefully! Once cooked, set aside. Next, take some of the tomato sauce and spread it over the stuffed calamari in the casserole dish. Place it in the oven at 375 degrees for about 10-15 minutes. You can tell it’s done when you can stick a fork through it easily. Once done, remove from the oven and place in the tomato sauce. Cook your spaghetti (or if you prefer linguine or fettuccini, you can use that instead) al dente. Add the calamari sauce to the pasta and spread it evenly throughout. Serve topped with grated pecorino romano or parmiggiano cheese. 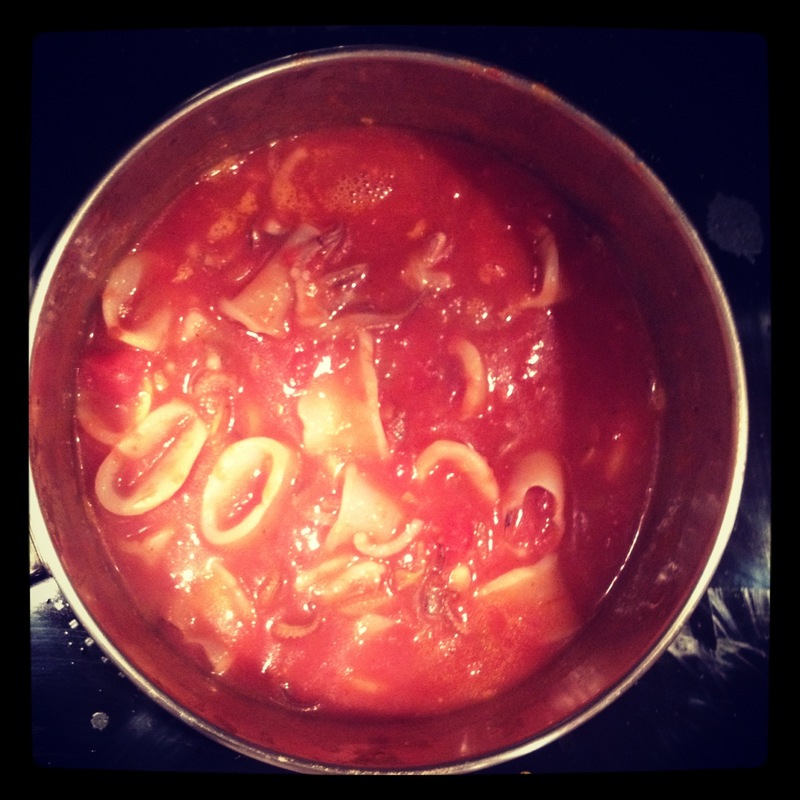 The calamari tomato sauce is best served right away for the best flavor. Clams casino and calamari ripieni in tomato sauce served with spaghetti are just two of the types of fish you can make for Christmas Eve. I hope that you will give them a try and make it part of your Christmas tradition. From my family to yours, I wish you a heartfelt Buona Natale or Merry Christmas!